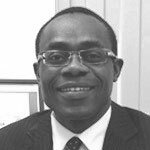 He specialised in Urology whilst in Bristol and the South West with Specialist interest in Urological Oncology / Cancer and Laparoscopic /Keyhole surgery. He developed laparoscopic urological surgery in Gloucestershire; and with his colleagues, pioneered the formation of the Robocap Charity working towards to establishment of Robotic Surgery in the three counties of Gloucestershire; Worcestershire and Herefordshire. Research fellow during his Urology training. Podium and Poster presentations in regional, national and international conferences. Several publications in peer-reviewed Urological journals. Participation in local, regional and national audit and research trials. Mr Aloysius Okeke does not hold a share or financial interest in this hospital, another Nuffield Health hospital or the company. Mr Aloysius Okeke does not have a share or financial interest in equipment used at this hospital or another Nuffield Health hospital. Mr Aloysius Okeke does not hold any paid advisory role(s) at this hospital or on behalf of Nuffield Health.